Angela "Watty" Watts is a service star in our service center at Zingerman's Mail Order. My favorite product is the Hummingbird Cake. Seriously? The BEST Cake ever. It's moist and flavorful, with a bit of everything in every delicious bite. 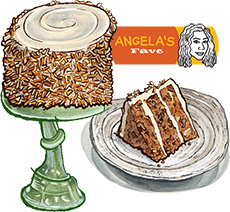 This cake has some of my favorite things mixed in it: pineapple, bananas, toasted pecans, and toasted coconut? Top all of that with real buttercream frosting made from real butter and vanilla direct from Madagascar? Yes Please! Normally I'm a dark chocolate sweets kind of girl, that is, until it comes to cake. The Hummingbird Cake has my heart. It's my go to for every time that I'm needing a cake fix; it's my birthday cake, my mother's day cake, my husband's 'I'm sorry' cake, and it was my 22nd anniversary cake.